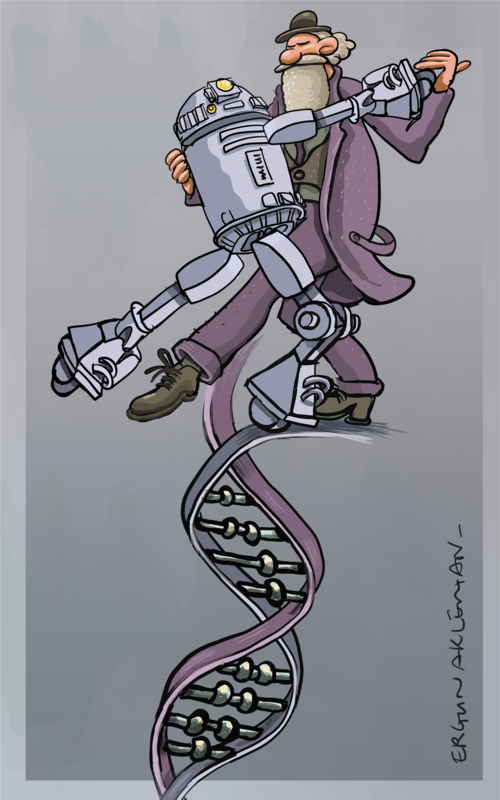 Banner Art: DNA strand bridged by abacus, symbolizing the extensive collaboration between biologists and computer scientists in shaping the genomics revolution. HOUSTON, August 2018 – Years after the end of the Human Genome Project (HGP), which mapped the human genetic blueprint, the ramifications to science and its culture are still unfolding. Ioannis Pavlidis, Eckhard Pfeiffer Professor of Computational Physiology at the University of Houston, Alexander Petersen, Professor of Management at UC, Merced, and their colleagues are reporting in Science Advances that HGP scientists not only laid the groundwork for scientific breakthroughs for decades to come, but also brought to the mainstream a collaboration model that changed science’s cultural norms. Since Galileo first peered into a telescope and DaVinci sketched out human anatomy, the business of science has been populated by independent endeavors. Systematic team efforts were transient exceptions. For centuries the image of the loner scientist was not updated, nor did it need to be – until recently. Pavlidis and Petersen report that after the sequencing of the human genome was completed in 2003, the consortium model did not go away, and scientists never returned to their silos. In a clear departure from norms, new and old researchers from biology, computing, and other disciplines kept building consortia, unlocking the genetic secrets of fauna and flora, and in the process transforming our ability to understand, predict, and edit life. “In an era where science has been professionalized, one cannot fully appreciate the reasons for genomics’ success unless s/he looks at the effect it had on the researchers’ careers,” said Petersen. To investigate this, the authors assembled a dataset that included biographic and funding information for over 4,000 faculty in 155 biology and computing departments in the United States, including information for their 400,000+ publications co-authored with a network of nearly 500,000 collaborators. Petersen and Pavlidis believe that as cross-disciplinary work continues, scientific advancements will follow suit. “If we continue to do this and have well-timed and well-designed funding efforts, as the Human Genome Project had, then I think we can put scientific progress on steroids,” said Pavlidis. Evolution of the collaboration network in the biology-computing college in the United States from 1990 (pre Human Genome Project era) to 2015. Links represent co-authorship relationships. 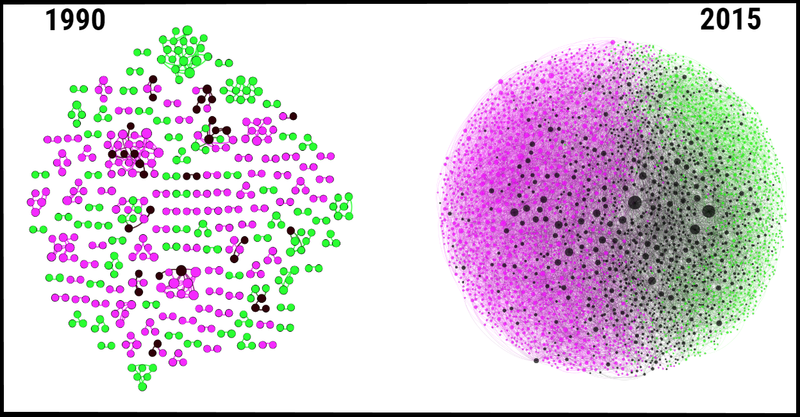 Green nodes denote biology faculty, magenta nodes denote computing faculty, and black nodes denote faculty from either discipline involved in cross-disciplinary genomics work. The size of the nodes suggest the centrality of the faculty in the network. 1990: the collaboration among faculty in the biology-computing college in the United States is characterized by few, small-size groups, working in isolation. 2015: the biology-computing college in the United States has grown into a massive interconnected network, where genomics faculty constitute a prominent part. 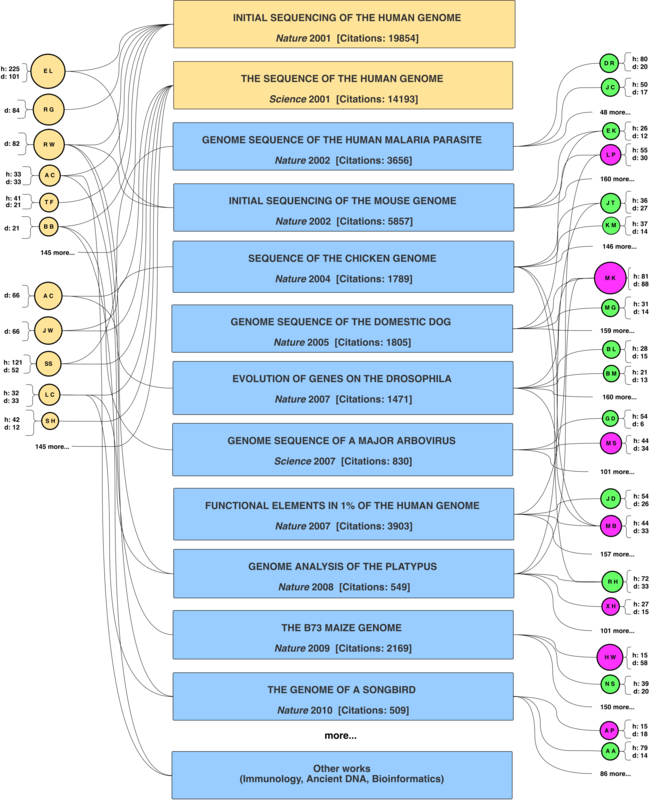 Consortium-level collaborations of the Human Genome Project (HGP) scholars with faculty in biology and computing departments during the 2000s, and some of the key publications they produced, powering the genomics revolution. The scholar nodes bear the name initials. On the left panels, one can recognize some well-known HGP scholars, such as Eric Lander (EL) and Bruce Birren (BB). “d” stands for the network degree of a scholar, and is commensurate with the size of her/his node. “h” stands for the h-index of a scholar. Green nodes denote faculty affiliated with biology departments. Magenta nodes denote faculty affiliated with computing departments. 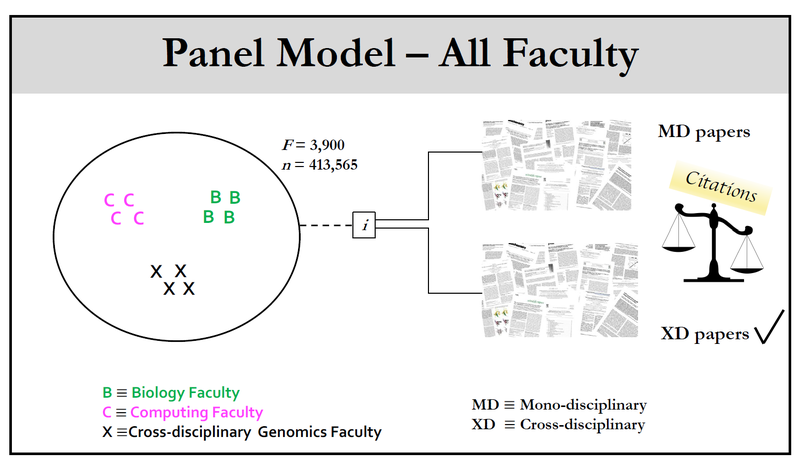 On average, cross-disciplinary faculty in genomics had more impactful careers with respect to their mono-disciplinary colleagues in biology and computing departments in the U.S. Career impact was measured in citations. The source of this higher impact has been traced to the cross-disciplinary portion of their publication portfolio.